BACK WHEN the Old-Timers started making wood signs, popular carving materials included timbers like Sequoia Redwood and Brazilian Mahogany. The problem is that using old growth wood is not environmentally sustainable. 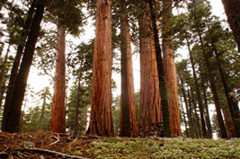 It takes 200-400 years to grow such trees and once they have been felled they cannot be replaced for generations! 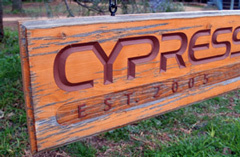 A wooden outdoor sign will peel, split, crack, rot, or warp over time. Insects tunnel through the wood. Water gets beneath the paint or clear coat and the wood sign swells. Additional cracks break the moisture seal and accelerate deterioration. A wood sign requires frequent maintenance to protect it. In extreme climates or with clear-coated wood you may need to refinish your sign every year or two to keep it looking good. Most sign owners today do not have the time, tools or skills to keep a wooden sign looking its best. For this reason many of the outdoor 'wooden signs' people see and admire today are not wood at all but a superior material called High Density Urethane. Danthonia rarely uses wood to make our signs. If you are looking for the beauty of a hand-painted wood sign - but want it to last - we recommend that you seriously consider the HDU alternative. Give us a try - we would love to carve you a beautifully long-lasting sign! Danthonia handcrafts our signs from Signfoam3 HDU [a closed cell foam with recycled content] laminated to a firm celluka foam PVC backing for added rigidity and superior hardware hold. 'High Density Urethane' is waterproof, insect-proof and fire retardant. It carves, paints, and machines like wood. 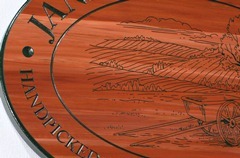 Our sign panels are the same weight as Redwood with comparable dent resistance. Our standard product looks and feels just like a painted wood sign. Especially if you choose the 'brush texture' for your design. For an additional 'custom artwork' fee our artists can create a faux wood grain. Your sign will look like clear coated wood. Weathering is superior to wood in exterior applications as it will not crack, split, swell or rot in the elements. Sign thicknesses average about 1.0 to 1.5 inches - depending on the number of sides and add-on layers required for the design. All carving is chiseled by hand and all artwork is hand-painted. We coat our HDU 'wood style' sign panels with Dulux Weathershield paints. These paints were developed for the harsh Australian climate - the manufacturer advertises a 15 year guarantee against cracking, blistering or peeling. These UV resistant paints use mineral pigments so most colors will show no significant fading for 8-10 years. Anti graffiti coatings are available on request.